Badgley Mischka Eau de Parfum – Lemming or Loser? Have you ever been convinced that you would love a perfume before even trying it? The scenario is quite straightforward and goes something like this; you notice a particular review or mention of a perfume on a forum and your interest is piqued, you then scour the blogs for reviews, draining the internet of all information on the particular subject. After you have soaked up as much info as possible you eventually track down and try the perfume for the first time and you fall in love. Or do you? Like many fellow perfume nerds Luca Turin and Sanchez’s ‘Perfumes The Guide’ is a perfume bible that has created many a lemming (i.e. 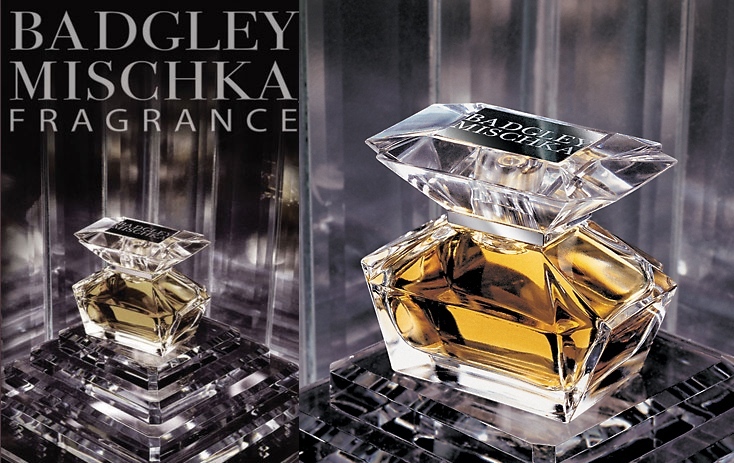 a fragrance love or lust) for equally a many perfume lover (as well as causing them to shout in frustration at their trashing of some of their favourites) and perhaps the biggest of these olfactory crushes for me was Badgley Mischka Eau de Parfum. Reading Tania Sanchez’s 5 star review of Badgley Mischka (see below) it’s not hard to see why I was desperate to get my hands on, what promised to be, a beautiful fruit bomb. Everything about it sounded perfect; huge fruit? Check! ; Lactonic notes? Check! ; Similarities to Angel and Gucci Rush? Double check! I just knew that I had to have a perfume that ticks all these boxes in my life. But how does Badgley Mischka smell to me? Is it a lemming or a loser? Well it does open with fruit but to my nose the effect isn’t akin to the “breathtakingly gorgeous fruity top note” that Sanchez (rather wonderfully) banged on about in her review and this is where the disappointment lies. The fruit has a fermented, almost champagne-like quality that is only intensified by a large slug of sparkle and fizz, and does not present any of the promised lushness and ripeness that I hoped it would have. The opposing forces of milk and caramel form the central core from which all of the fruit and fizz emanates. It could all be tooth-achingly sweet but the bitterness of flowers keeps the caramel firmly in check and makes for a very comforting mid-section that is easily the most attractive part of the fragrance’s development. In her review Sanchez says that Badgley Mischka “thins” in the base and I can very easily go along with that. The cosiness of the caramel intensifies before trailing off into a vague and astringent woodiness that is accented by an incredibly Gucci Rush-esque plastic patchouli note. Badgley Mischka Eau de Parfum is most definitely a fragrance that I am on the fence about. I concede that it is very nicely done but I can’t help but feeling that I should like it more than I do and when compared to similar fragrances such as Rush I can’t help but feel like I’d rather have the Gucci. It’s quite tricky to find Badgley Mischka EDP here in the UK but keep your eyes peeled on eBay, I picked up a 15ml travel spray for £7! Image 1 via urun.gittigidiyor.com & hellacosmetique.gr (combined). Notes via Bergdorf Goodman. Quote via Perfumes The A-Z Guide. Posted in Badgley Mischka, Feminine, Floris, Fruity, Perfume Reviews and tagged Badgley Mischka, Floral, Fruity, Luca Turin, Perfume, Perfumes The Guide, Tania Sanchez. Bookmark the permalink. I got a bottle of this in a swap. I also had a different idea of what it would smell like based on the review in The Guide. I find the fruit to be more fizzy and fermented too but I’m okay with that because I don’t like fruit salad accord all the time. It’s not fresh fruit and it’s not too sweet. I’ve never smelled Rush so I can’t compare it to that. I will say that the person I swapped with wears the extrait of this and was kind enough to send me a sample of that. The extrait is much richer and fruitier than the EDP. I almost wonder if they reviewed the extrait in The Guide even though it says it’s the EDP. Anyway, I wasn’t sure about the EDP at first either but I gave it time and I like it now. The extrait sounds like the one to go for then. Maybe I just need more time with the EDP? I’m with Poodle, extrait is fun, EdP is meh on my skin. I’m glad to have you back at the typewriter though. I’m glad we’re on the same page with this one, I’ll go for some of the extrait. I had the very same experience! I was so prepared to love this and found a mini on eBay. It was sweet, cloying, and worst of all, ordinary! I should know better, however. I’m not a huge fan of fruit in my perfumes. I tested it once and didn’t care for it so I passed it on. I’m so glad I’m not alone in my BM conundrum! Yes, you just described me to a T Thomas with my fragrance MO! I can’t list the amount of blind buys I have because there are too many to list, but I remember only one I didn’t like, Bandit. I have spent a shocking amount of money using the research methods you describe ;-)….But thankfully, the vast majority of reviews I have read painted a reasonable portrait of the many scents I have been interested in, so with the one abovementioned exception, I haven’t been disappointed. Normally there are only two words in perfumery that make me lose interest immediately – fruity floral. Oh yes those fruity florals do tend to be bad don’t they? There are a few good ones though! It sounds like you enjoy a good blind buy and whilst I don’t do it so much now I must admit that it’s a fun way to do things. Like you, I *needed* a sample based on Tania Sanchez’s review, but it didn’t move me. I now know better; these days that list of notes might tempt me to smell it if the bottle were right in front of me, but I wouldn’t seek it out. It sounds like quite a few people have a different picture in their head for this one because of Tania’s review. I just wish I smelled what she smelled! What? I love Badgley Mischka! It’s so big! I like the fermented note too. I’m so on the fence about it. I guess it’s just not what I expected it to be. I bought this based on TS’s review, and wow, did I ever hate it! It completely grossed me out. Ditto with Mauboussin, the original, but I think I got a bottle of that which had been cooked in the European Heat Wave (the big one). The Guide is a fun read, but it is not to be trusted…. Awww no, don’t tell me Mauboussin is pants too? I was looking forward to that one! Completely agree re The Guide. Had high hopes for this one too – and I do like it, and I do this it’s a good bit better in the parfum formulation (in the black velveteen box). There’s a more pronounced chypre presence with a stronger oakmoss in the base tempering the sweet and extending the fruit in a more balanced manner well into the drydown. So I gifted the EDP to a friend and bought two 1oz bottles of the parfum. Good deal on Amazon too. Very late to your conversation but this was a big giant disappointment to me too. Mauboussin is lovely stuff though and if you like fruited ambers give Miss Dior Le Parfum a sniff or Futur. Then again The Guide also says my very loved Must de Cartier is terrible but I completely agree with Tanya’s assessment of Bvlgari pour femme. The Guide is definitely to be taken with a huge dollop of salt – still it’s very entertaining. Mauboussin sounds fab – will have to try!